We had the opportunity to assist Aramark in their communications plan for their upcoming wellness fair. Aramark wanted to boost employee morale, urge employees to be mindful of their health and promote Sharecare, their wellness partner. Their primary goal was to encourage onsite employees to attend the fair. This was promoted with the use of banners, posters and table tents. These items advertised the time, date and location of the fair, and also promoted the activities to come and exciting prizes available for successful participation. Floor decals and wall signage helped employees to navigate the area with ease, avoiding traffic buildups and congestion, which can often cause frustration and early departures. The communications had a travel theme to help incorporate movement throughout the fair as well as encouraging the greater journey to better health. Upon entering the fair, employees collected passport booklets to highlight the vendors present and stickers were "stamped" inside to indicate who they had visited. These completed passport booklets then served as their entry ticket for multiple prize raffles and as a valuable reference tool for vendor contact information. The wellness fair also featured visits from other vendors, giveaways, food, and chair massages as additional ways to reward employees. 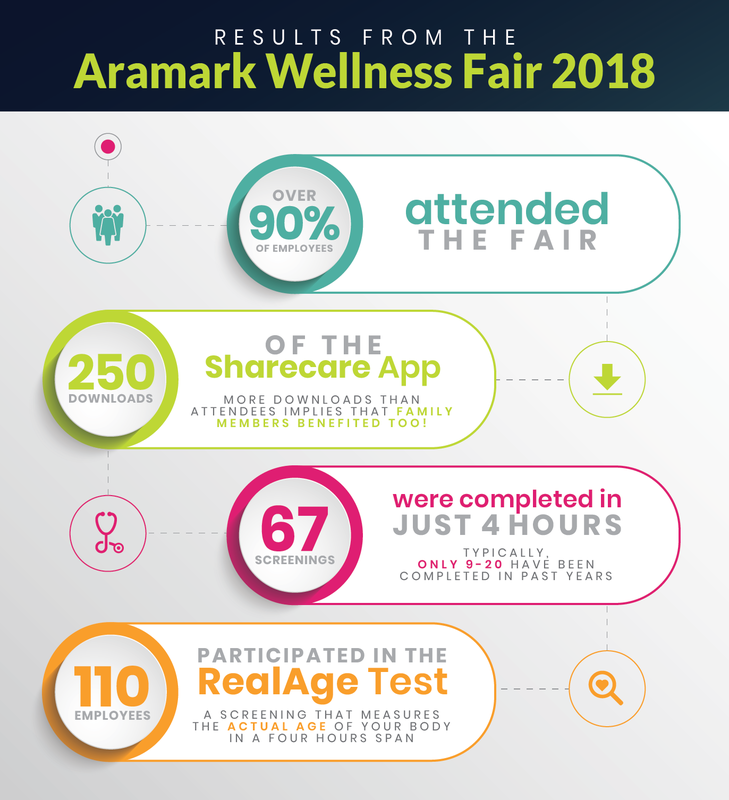 The second, and ultimate, goal of the wellness fair was to provide employees with the tools necessary to take control of and improve their health and well-being while representing how much Aramark deeply values and appreciates their health, happiness and hard work. Over 90% of employees were in attendance. 250 downloads of the Sharecare app—more downloads than attendees implies that family members benefited too. 67 screenings were completed (typically only 9-20 have been completed in past years). 110 employees participated in the RealAge test, a screening that measures the actual age (overall health- physical, emotional, etc.) of your body. One of the driving factors for the success of the wellness fair was the effectiveness of the communication which helped drive interest, engagement and participation. The fair boosted employee morale by showing the employees that their company truly cares about their well-being and values the work they do. With the right communication you can successfully convey your message AND have a positive impact on your employees. We are excited about helping our client with a succesful wellness fair and we are looking forward to continuing a winning streak with Aramark! Check out our work and photos from the event provided by Aramark below! To learn more about this project, visit our portfolio. Need help planning your next wellness fair? We’d be happy to share our Spitfire spark with you!